Based on hundreds of interviews conducted from 1988 to 1990, during nine trips that covered forty thousand miles, The New Russians tells the story of the second Russian revolution. Here is grass-roots reporting that takes us inside Gorbachev’s U.S.S.R., by a correspondent who speaks Russian and who brings us face-to-face with the new Russians in their homes, at work, and in school. 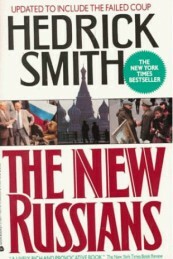 Hedrick Smith exposes the roots of reform, ideas that were germinating within the U.S.S.R. during the late seventies and early eighties, but were hidden from view. He shows how they came together under the leadership of Mikhail Gorbachev, and gives the inside story of how Gorbachev rose through the system, gathering allies and ideas from people like the ones you will meet in The New Russians. Smith introduces us to farmers struggling against the Communist tradition; journalists fighting Party controls; industrialists feuding with the bureaucracy; new entrepreneurs trying out capitalism; Party leaders maneuvering to hang on to power. Smith explains the “culture of envy” that operated within the Soviet system, stalling economy reform, and he reveals the toll taken by decades of political stagnation and deceit. He explores explosive nationalist tensions in Lithuania, Armenia, Azerbaijan, Central Asia, and Russia itself; and presents a portrait of Boris Yeltsin, the political rebel, and the new democrats of Russian politics. “Fast paced and lucidly written, The New Russians allows the reader to feel, as it were, the pulse of perestroika.